We have all heard them say that marriages are made in heaven and celebrated on earth. Moreover, that celebration is usually grand. When preparing for a wedding, there are literally piles of work to do. Your work includes preparing for the necessary marriage documents, booking of church and party venue, gown fitting, food tasting, and so on. Breathe. After doing all these things, there are still crucial tasks to be done which will make or break the entire wedding celebration: the programs. Wipe your worries away. 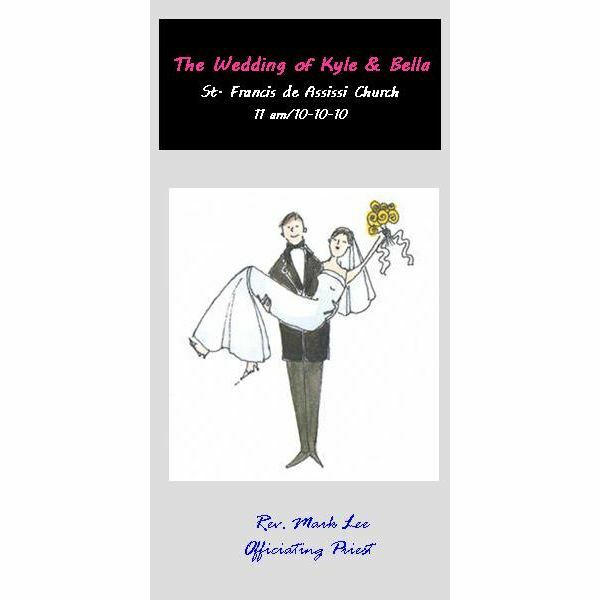 Simply use this sample of a wedding ceremony program. You are probably thinking of a very formal wedding ceremony layout in neutral colors with your very formal message in a very elegant script. Why not try something fresh and unique? Consider creating a cartoon version of yourselves and have them printed. Try this DIY program cover that will surely set your invitation apart. Have someone draw a cartoon version of yourselves. Using Microsoft Office Publisher (or any similar program), upload the drawing. 5. Add a simple ribbon and voila! A unique wedding program. 1. Emcee gives a warm welcome to guests and thanks them for gracing the wedding. 3. Emcee prompts guests to stand up and clap as the bride and groom enter the reception area. 4. Emcee prompts the release of doves. 6. Emcee calls the bride and groom for the cake cutting. 8. Emcee announces that it is time to eat. 9. Picture taking of guests with the couple while eating (the newlyweds go from one table to another).